Patriots tight end Rob Gronkowski made a fan's dream come true before her heart and kidney transplant. A New England Patriots fan who has been in a Boston hospital for months awaiting a heart and kidney transplant got her wish Monday - a visit from Rob Gronkowski. Twenty-seven-year-old Lauren Meizo of Chicopee, Massachusetts, posted a YouTube video last week saying that her one wish was to meet her hero Gronkowski. Meizo suffers from a rare form of Muscular dystrophy, and this would be her second heart transplant in five years. "The reason I am making this video is I would love for Rob Gronkowski - Gronk - from the New England Patriots to come deliver the news of when I get the call," Meizo said in her video. In case that was too much pressure, she said she'd be happy to just meet the tight end. "Anytime you want, because I've got nothing but time right now." In an interview with NBC10 Boston last week, Meizo joked that she would like a meet and greet with Gronk with "no surprises" because she is a cardiac patient. On Monday, Meizo's wish was granted. 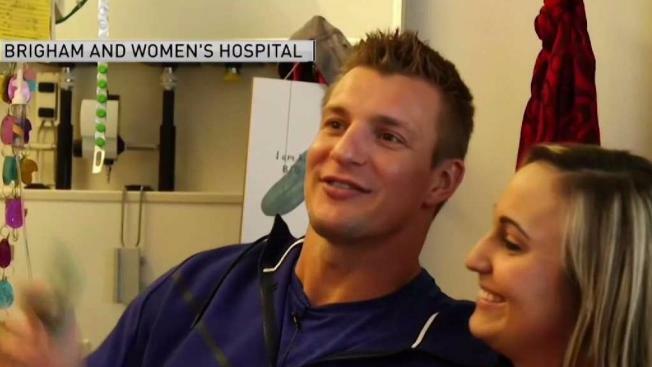 She posted a photo of herself and Gronk in her hospital room, along with the caption "GRONK MADE MY WISH COME TRUE!" Photos were posted online of Meizo with Rob and his brother Gordie Jr., who brought her several presents, including an autographed jersey and teddy bear. There is no word yet on when Meizo's transplant will take place.